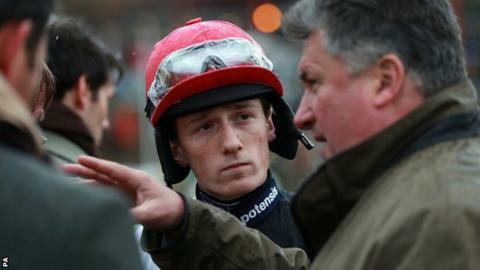 Champion trainer Paul Nicholls has revealed Sam Twiston-Davies has replaced Daryl Jacob as his number one stable jockey. Twiston-Davies, 21, has been used regularly by Nicholls and has ridden multiple Grade One winner Big Bucks for the Ditcheat stable on two occasions. "It had been widely expected Sam Twiston-Davies would get the biggest riding job in British jump racing; it was just a case of when. "The appointment is the latest chapter in the rise and rise of the talented and popular young jockey who, many believe, will one day be champion." "Daryl Jacob, who won the Grand National for the Nicholls team on Neptune Collonges when number two to Ruby Walsh, has not done a great deal wrong during his short tenure in the hot seat, but things just haven't always worked out." "Sam will have the pick of our team," Nicholls wrote in his Betfair column. Jacob elected to go freelance upon hearing of the decision, leaving Nick Scholfield as the stable's number two. Nicholls, who won the trainer's title for the eighth time in April, says there has been "no falling out" with Jacob, his leading jockey since Ruby Walsh stepped down in 2012. "Daryl will continue to ride out and school a couple of times a week here next season, and will ride for us when the opportunities arise, which I am sure they will," added Nicholls, 52. Twiston-Davies won 115 races in the 2013-14 season, claiming 10 victories in 42 outings on Nicholls rides. Despite becoming the number one rider for Somerset-based Nicholls, he will continue to ride The New One for his father, Nigel, who trains the Grade One winner. Noel Fehily will retain the ride on the Nicholls-trained Silviniaco Conti - having already won four times on the eight-year-old - who claimed the King George VI Chase in 2013.